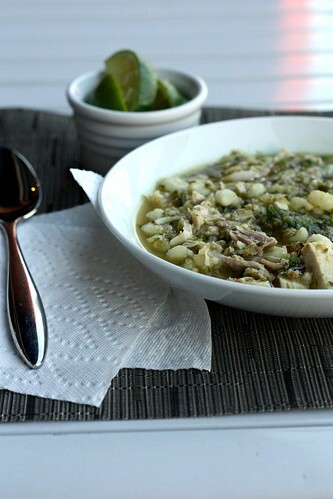 White Chicken Chili – Elly Says Opa! The resulting soup is one that is hearty and delicious. It’s not overtly spicy (Zachary had no issues eating this) and the flavors are just so well-rounded. I was so excited to have this as leftovers for a couple of days, which is always a true sign of a recipe’s greatness. Another good sign is that I can officially move this post out of my drafts, and into my published posts. Season the chicken liberally with salt and pepper. Heat a large Dutch oven over medium-high heat and add the oil. Once hot, add the chicken, skin-side down, and cook about 5 minutes without moving until golden brown. Flip the chicken and brown on the other side, 3-4 minutes. Remove the chicken from the pot and set aside. Drain off all but 1 tablespoon of fat from the pot. Meanwhile, add 2 of the jalapeño peppers to the bowl of a food processor along with the anaheims, poblanos, and onions (do this in batches if you don’t have a very large work bowl). Process until the consistency of chunky salsa, about 12-15 pulses, scraping down the sides of the bowl halfway through. Place the puree in the Dutch oven over medium heat, along with the garlic, cumin, coriander, and about 1/4 tsp. salt. Cook, covered, for about 10 minutes or until vegetables soften, stirring occasionally. Remove the pot from heat and place 1 cup of the vegetable mixture, 1 cup of the hominy, and 1 cup of the chicken broth into the bowl of a food processor. Process for about 20 seconds or until smooth. Place the mixture back into the pot, and add the remaining 3 cups of broth. Place the browned chicken in the pot and bring to a boil. Reduce to medium-low and simmer, covered, until chicken registers 160º, stirring occasionally. This should take about 20 minutes. Remove the chicken with tongs and transfer to a plate. Stir the remaining beans into the pot and simmer for 10 minutes. Meanwhile, discard the skin from the chicken and dice the meat. Stir cut/shredded chicken, remaining minced jalapeño, lime juice, cilantro, and green onions into the pot. Simmer to warm chicken through, and season to taste with salt and pepper.